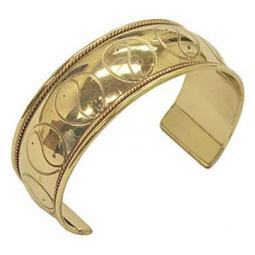 Sorry, we are currently sold out of 'Om Symbol Bracelet in Brass and Copper, 1 Inch Wide'. Please click the Wait List link below and you will be notified when it is back in stock. 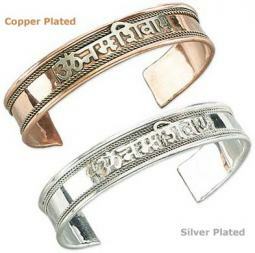 Brass and Copper Om Symbol Bracelets from Nepal, one inch in width. 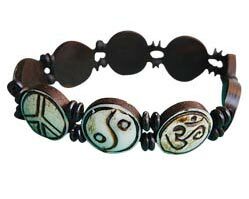 these Om Bracelets are flexible enough so that they can bend to fit most any wrists of both men and women (although they might be a bit small for men with particularly large wrists). These bracelets feature engravings of the Om Symbol across the outside, while the edges of the bracelet have copper trim running along it that gives these Om Bracelets a little added detailing. 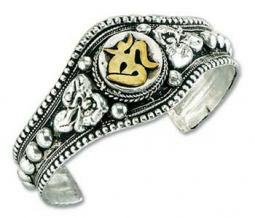 The Om signs engraved on these bracelets appear in a row across the front. They are shiny and polished looking, and we think these bracelets look especially nice on people with tanned or darker skin, although they will look good on the wrists of people with light skin as well.